The WSSDAR has been true to the precepts of the National Society of God, Home, and Country; and to our own State Society of Patriotism, Reverence, and Remembrance. We have made a difference in the lives of hundreds of military members at home and deployed, and to the veterans we honor in so many of our activities. Thousands of dollars of goods have been donated and sent abroad to support our troops. 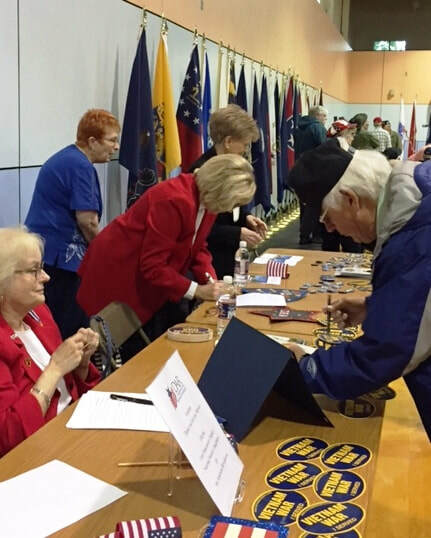 In addition, the WSSDAR chapters contribute annually to Wreaths Across America. Providing more than 200,000 hours of volunteer time annually to veterans in Veterans Administration hospitals and non-VA facilities. Offering support to America’s service personnel in current conflicts abroad through care packages, phone cards and other needed items. Sponsoring special programs promoting the Constitution during its official celebration week of September 17-23. Sacajawea Chapter Member, NSDAR is proud to be a 12! Army Nurse, Lieutenant Colonel Barbara Nichols, Retired, was chosen to raise the 12 Flag for the NFL Seattle Seahawks at their annual Military Tribute game on November 20, 2017. Barbara’s military service extended from World War II, to Korea Mash units, and finally Vietnam where she earned the Bronze Star for meritorious service in a combat zone.